Little tartelettes don't have to be an exercise in logistics. In fact, they're the easiest things in the world once you have laid claim to your crust. I don't mean once you have decided on a recipe, I mean once you have pinched together cold butter and flour enough times that it is one of the tasks you consider as basic as chopping a couple of onions. Part of your way in the kitchen. A couple of years ago, I found a little book on one of the riverside booksellers' tables. It was from the 1960s, full of your average French housewife's recipes for basic tarte crusts, cakes and home made creations. I wanted a glimpse into what the average French person 50 years ago put together on their kitchen tables. These recipes were not the ones that we have gotten used to these days, you know, the ones that strutt their stuff, expanding the technique and ingredient list to include every possible variation, noting every movement of the cook, adding skimming and sifting and doing things in clockwork fashion, not to clarify or instruct, but to stress, in a kind of patronizing way that yes, you really do need this recipe, you need to buy this book. I admit I never had much patience for these enormously self important kinds of recipes. This little paperback handbook claiming on the back to have "really, we mean really, every pastry recipe you will ever need" that cost me a 50 centime piece was in my hands, and I was flipping through it, looking at a different kind of recipe style. A nice easy fast feulletage came out of that one, and a wealth of knowledge. First of all, something that struck me, while I read through these very simple recipes, was that for the crusts, they were all variations on one basic formula: flour, butter, salt, water. Second, the ratios were quite varied. You mean, there isn't just one way to make a tarte crust? Here is the method that is currently my way in the kitchen for making a shell for a tarte, quiche, tartelette, etc. Start with impeccably clean hands and take a smallish piece of good butter from the refrigerator and weigh it, put it into a bowl. 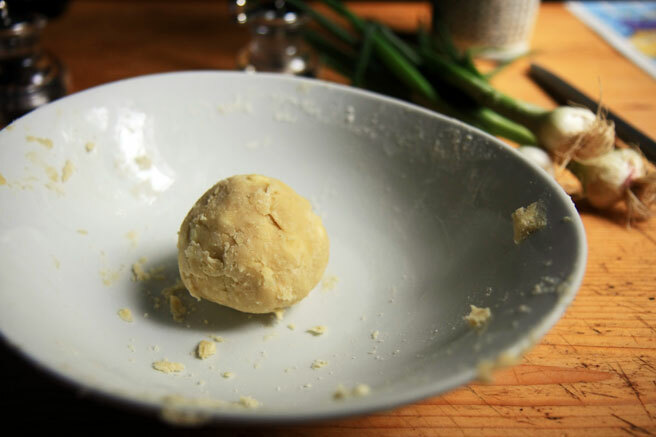 Add twice the butter's weight amount in flour and a sprinkling of salt. Use a fork to mash it together until you have little lumps. Get an ice cube and hold it in your hands, until it starts to melt. Then work the melting cold water lightly into the dough with your fingers just until you can pat it into a rough ball. Little lumps of butter are ok. If you're making more than you can comfortably melt ice in your hand for, go ahead and use ice water. Let your ball of dough rest in the refrigerator. 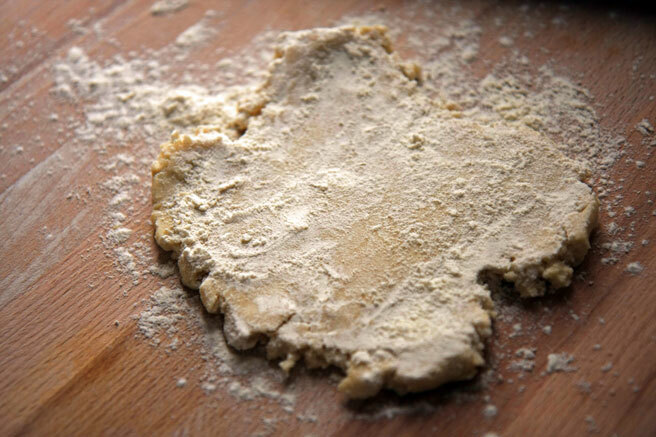 Don't ever knead it, it will get tough that way. When you're ready, you can roll it out and use it. Voila. 1:2 butter:flour, plus a pinch of salt, add cold water. Once you have that down, you have just added a lot of options for apero, appetizer at the table, main course, and dessert. Especially useful when you haven't planned anything in particular and you have bits and scraps of vegetables, meats, cheeses, and fruits you need to use up. That would be nice, Amy. There's always a list of things we find daunting and part of the fun is tackling them. It's so easy you'll always wonder why you didn't start earlier. Thanks for stopping by! I couldn't agree more... 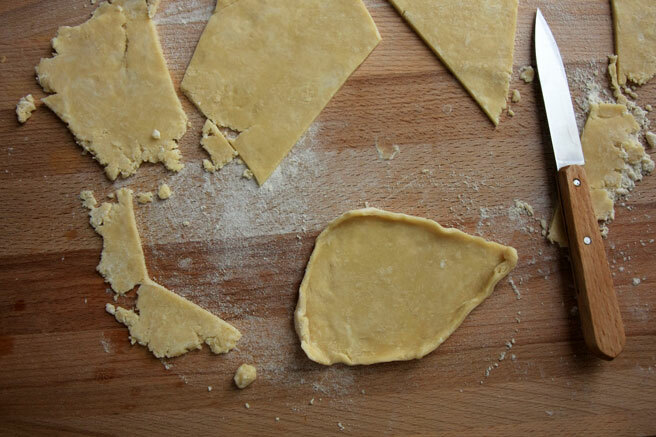 I used to find pastry-crust-making so intimidating, but now I do it routinely. I do "cheat" a little and use a food processor, but it's what works for me and I get a good result. Now, if I could only get over that mental block with canning as well! This is so amazing to read. Can this be that simple? What would be the amount of butter to use for a 2-person quiche? Thanks! Almost as long ago as your little book, my mother taught me how to make tarte crusts. A little different from your description, but no less simple. You will have made the task much less daunting for many who will read this post. I love your strutt your stuff about today's recipes; it is so true. Noelle, whatever works best for you! I also used to do it in the food processor until one day I didn't have one available and did it by hand. I hate doing dishes so doing it by hand makes it easier for me. 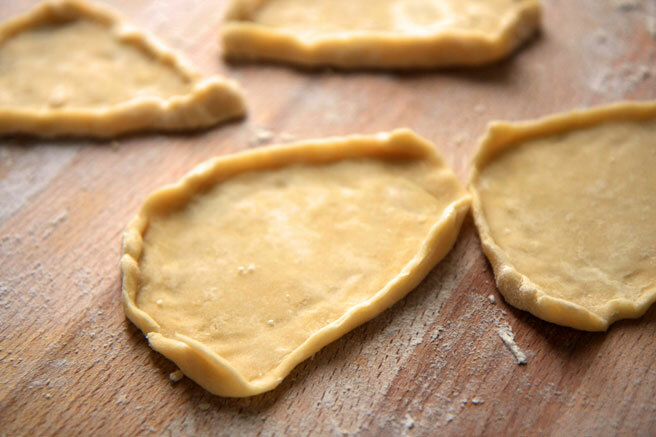 Gosia, try 50 grams butter 100 grams flour to start, and see what you can do with that. You'll know the next time if you want to add a little or take your crust down in size. Thank you, Christine. It isn't as mysterious as people make it out to be, that's for sure. I remember when I first started out, feeling so lost and tired already when looking at some cookbooks. Then I realized how easy these things really are. Thanks for posting this. I'm obsessed with tarts and have been attempting different doughs, trying to find the perfect one. It's really been an adventure but it's great to have gotten the hang of it. Nothing beats a homemade tart. Hello Lucy, thanks for this recipe. For someone who's clueless about pastry, that's pretty good way to demystify the whole process. However, I'm struggling with one part: how to spread the ball of dough and place it into the pie dish? Mine always breaks into little pieces and I'm not happy with the results. Could you share your technique?